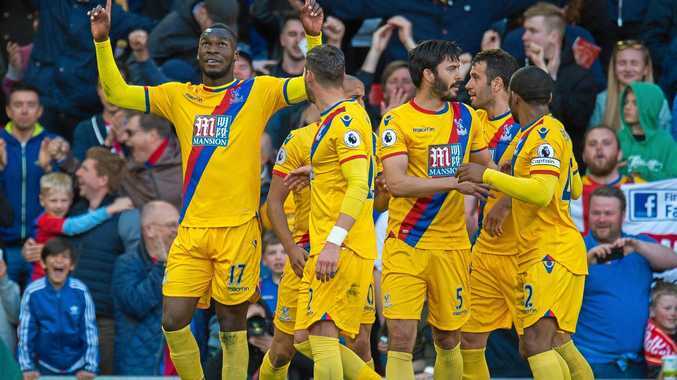 CRYSTAL Palace has boosted its English Premier League survival hopes and dented Liverpool's top-four aspirations with a surprise 2-1 win at Anfield. Sam Allardyce's team has now won six of its past eight games, including victories over Chelsea and Arsenal, to move seven points clear of the relegation places. Liverpool old boy Christian Benteke haunted his old club, scoring twice after Philippe Coutinho had given the home side the lead. "Travelling up yesterday, we saw the other teams (Hull and Swansea) won and that put pressure on us," Palace's Andros Townsend told Sky Sports. "But we have made a habit of upsetting the big teams and have done it again thanks to the big man." Manchester United, meanwhile, closed the gap on fourth-placed Manchester City to one point and is now five points behind Liverpool in third with two games in hand on the Reds after a 2-0 win at Burnley. United boss Jose Mourinho made eight changes from Thursday's Europa League win over Anderlecht with Wayne Rooney and Anthony Martial given starts. Both scored as United extended their unbeaten run in the league to 23 games ahead of a crucial Manchester derby on Thursday. For Liverpool, the home defeat is a blow to its hopes of a top-four finish. "We were not at our best," manager Jurgen Klopp said. "We tried everything - changing systems - but it didn't work that well because we had a bit of nerves. "There are games to play and we will be ready." Burnley has won just once in its past 11 EPL games and is just five points clear of the relegation places in 15th.